When I finished the last update we had made it to Los Alamos last Sat. night. Sun. am, I started with a 4 mile run which looked something like this... ( see pics above) After the run, we toured White Rock with a great Overlook area, and Bandelier where we took a short hike with a Ranger who gave us some information about the ancestral Pueblo people. On the way to Bandelier we encountered some bikers who were in the middle of the Tour de Alamos bike race. Then we headed back to Los Alamos to explore some of the museums and to learn more about the Manhatten Project. It was interesting to learn how the scientist and their families lived in total isolation and secrecy during this time. Today over 8000 people are still employed at the Los Alamos National Laboratory and you have to wonder what they are working on now. Next we headed to the Jemez Mountain National Scenic Byway. The Valles Caldera was one of my favorite parts of the trip. Interesting - they had a marathon a couple of weeks before our trip. Maybe one day I will make it back to explore the area on foot. After we drove through the Jemez Springs area we finally came across our much anticipated Fry Bread. "hallelujer" (as Madea would say) Fabulous! Each year, Linde and I usually have a word or a phase that we repeat, like a million times, on the trip. This year it was "FABULOUS!" The next stop was Albuquerque. 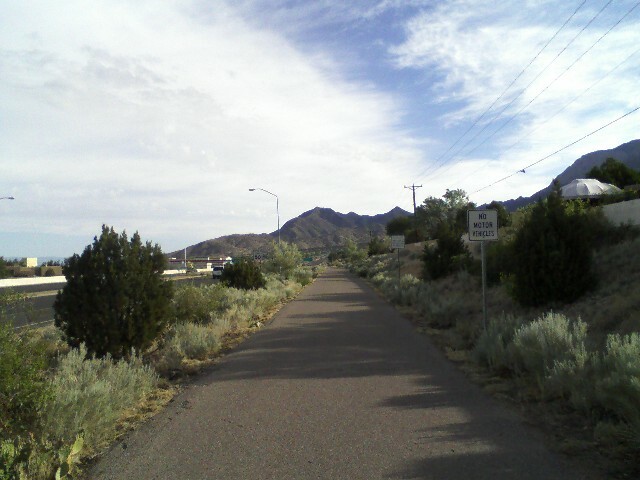 My favorite part of ABQ was my running and Sandia Peak area. 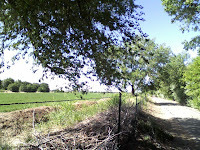 Last Monday, I ran 7 miles on the trail at the Rio Valley State Park. 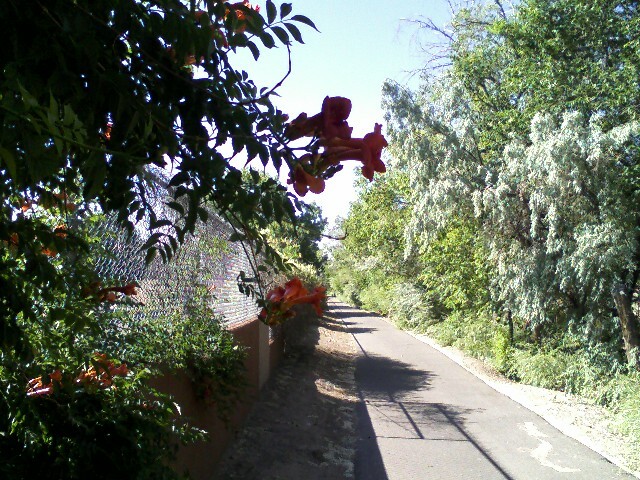 The trail runs along the Rio Grande River. Sat. we rode around the Sandia Crest area and toured Tinker Town. Sat. evening we rode up the Sandia Crest Tram to see the sunset. This is the world's longest tram - a little scary. Tues. was my last morning to run in dry air, so Linde and Mom were generous enough to drop me off at the trail that runs along Tramway Blvd. I ran 9 miles and they went to breakfast. After the run, we packed and started the long journey home. When we made it back to Atlanta, I lucked out because Delta had overbooked the flight, and they needed a volunteer to stay in Atlanta and in return they offered overnight accommodations, food vouchers, and a $300.00 voucher for my next flight. Sweet - ready for our trip next year! So this week, with the vacation, I managed to get 34 miles of running, 4 miles of walking, and some stretching and yoga poses. Months ago my Mom (Eli) and my sister (Linde) planned our annual trip. Of course, I didn't realize at the time that my hubby would be out of work because of the BP disaster. After stressing, debating, and encouragement to go ahead with the trip from Chad, I decide to go forward with my plans. The flight and my portion of the hotels was covered, so all I needed was to cover my food for the trip. So off to New Mexico for a week. We landed in Albuquerque and made our way to Santa Fe for our first stop. Santa Fe is the 2nd largest art market in the US with over 200 galleries. 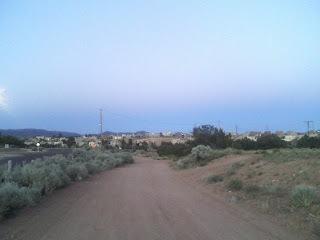 On Wed., after giving up our search for the Dale Ball Trails that Happy Trails recommended, I ran 5 miles on Cerrillos Rd and ended my run on this road near our hotel, just before dark. Thurs. I read about a nice trail along the Santa Fe River....well let's just say, I'm not a "real" trail runner because this was an overgrown snake pit, in my opinion. So I ran on the road along the Santa Fe River on Alemeda St. and Canyon Rd. Nice run enjoying the art sculptures along Canyon Rd. Palace of the Governors - we shopped for turquoise from the Native Americans - Success! We toured the Georgia O'Keefe Museum, but we were disappointed that the current display was abstracts. We really wanted to see the O'keefe landscapes. We toured the Loretta Chapel - interesting story about the staircase - google it. Fri. we headed out of Santa Fe heading to Taos. Ghost Ranch, the Rio Grande Gorge Bridge, and then we headed on to Taos. 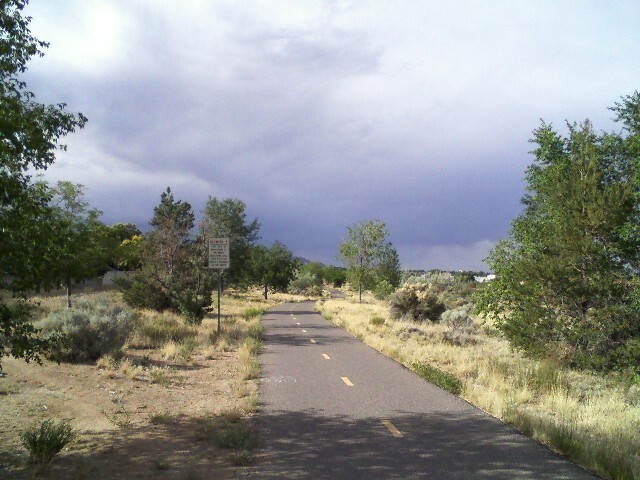 Fri. am, I started off with a nice 6 mile run down the road in Taos. I was out early because we had much touring to do. 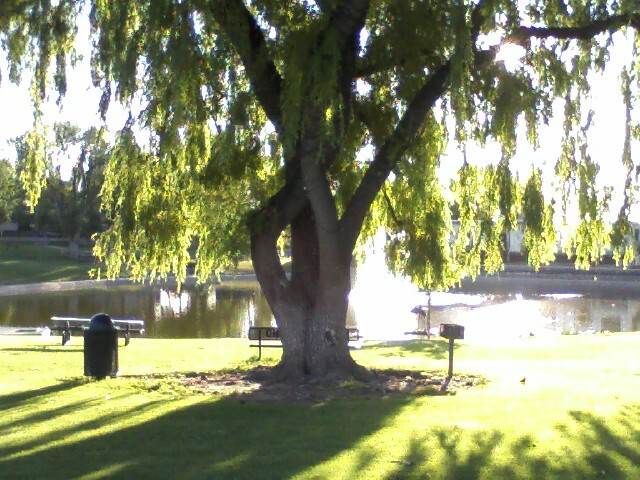 It was 50 degrees when I started my run, what a treat to escape the heat and humidity. I ran a 1 mile w/u and then ran a 2 mile tempo run around 8:30 pace, and then 3 miles back to the hotel. Our first stop of the morning was the Taos Pueblo. We were hoping to luck up on some bread or better yet, some "fry bread". It was mentioned, prior to our travels, that this may be "somewhat commercialized" and I would have to agree. It was interesting, but has turned into a money maker. The travel books say 100 residents still live as the ancestors lived 1000 years ago.... I don't think so....not from what we saw, and the worst part - no bread. Next stop was Questa where we tried to see a stain glass shop from a local artist, but no luck here either. He was out for the day. From here, we headed to the Rio Grande Wild Rivers area. Linde and I decided to hike the La Junta Trail which is a 1 mile hike down to the confluence of the Rio Grande and the Red River. In the picture above the Red River is on the left and was much greener, and prettier than the Rio Grande on the right. We survived the hike back up, and then we continued along the Enchanted Circle. Vietnam Veterans Memorial State Park @ Angel Fire. This is an amazing memorial in a spectacular setting. We had dinner at the Rancho de Chimayo. This was another recommendation from Kathleen @ Happy Trails. It was fabulous! As we left the restaurant we were just in time to enjoy a great southwest sunset. After sunset we landed in Los Alamos. I will start there on my next blog. After the Blueberry 5k this weekend, I was shocked at my time. So Sat. afternoon I did some research to see how far I had to go back, to find a 5k time slower than Sat. 's results. For some time, I have wanted to list all of my races in one place, so my shock with my race time prompted me to compile the data. The answer to my question was 5 years ago. 25:47 - WHAT? It's funny! I did not go into Sat. 's race with any expectations of a fast 5k. 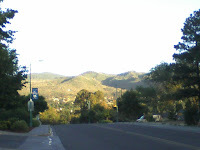 This is only my 4th week back to running and I have not had any speed work, except, I did do one hill workout - the grueling "billboard run." I just wanted to race so I headed down to Poplarville, MS. In addition to no speed work, the heat index has been over 100 each day for a while now, and Sat. 's high was no different. So the race started with a steamy, humid temp. - 78 degrees, with the heat index at 93 degrees, at 8:00 am. Over the last few years I have learned to run in the extreme heat and humidity of summer in the south, but I have not, to date, learned to race well in it. My other continuing battle is to run well on hills. Summer, fall, winter, spring - nope - I am not a hill runner, not yet. So the 5k on Sat offered all of my biggest challenges in running - heat, humidity, and hills. Now I'm on a mission. I am excited and ready for speed work. I have NO, ZERO natural speed. You guys know how I love to analyze the what, why, how, why not, when, etc. So when I look back at "how can I run THAT slow?" it's really easy to figure out. *For several years, I have basically run speed work year around, until Nov.
*Late Nov. hurt my hip. *Desperate to make it to the starting line at Boston, I ran very conservatively with no speed work for Boston. *Almost 7 months of no speed. So now I am running on "pure talent" Bahhhhhh! LOL! I have no talent for speed, I have to WORK for it - ALWAYS! * 24 seconds per mile slower than my last 10k pace in March - again I say WHAT? Wow! Speed work does a body good! I am excited for the challenge ahead of me. The good thing is, I will quickly be able to see results, and that will be fun. Today I did an introductory speed session. I had to slow my times tremendously based on Sat. 's 5k time. It was fun to get back to the speed work. Update - no new, or good news on the job issue for my hubby. Should have some great pictures to post on my next blog. This is my life today! Warning - this is VERY SAD! As of May 28th my husband no longer has a job. In 1998, he started charter fishing in South Louisiana- (www.dufrenesguidesevice.com) - taking people fishing for speckled trout and redfish. We are both self-employed and we love our way of life. In a very short period of time everything has changed, and currently we do not know what the road ahead has in store for us. I have faith that things will work out, and in the mean time, as usual, my running becomes even more important to me. 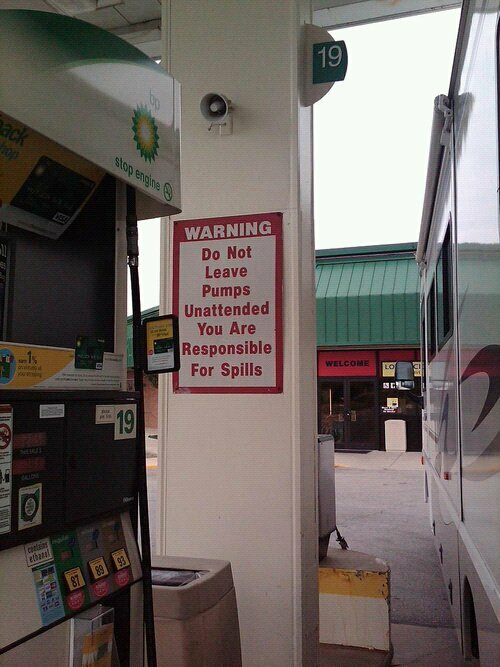 Currently we are looking into the possibility of going to work for BP. As we investigate we are worried about health issues, and the possibility of ruining our boat. On the other hand, we need money to survive, and good paying jobs are NOT easy to find. When one door closes....another one opens. We pray families of the 11 people who died in the initial blast on the rig and realize that yes, we are entering a very scary time, and what we had in the Gulf may never be again, but we have our lives, and our family, and that is the most important thing. Running - today I start my 4th week of running. I am feeling good, loving it, and starting to add a few quality runs, but mostly - just running. 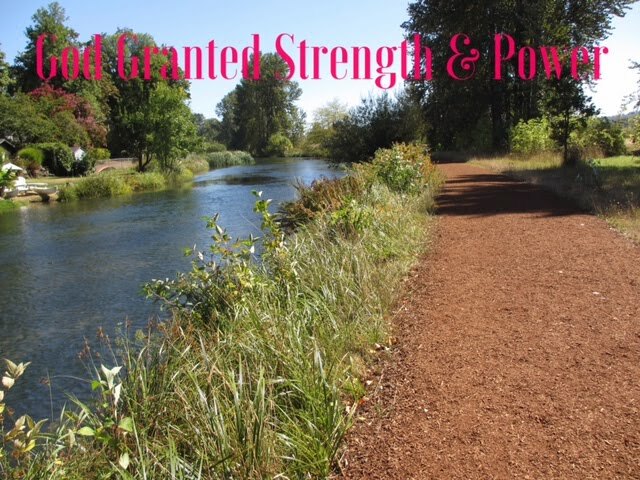 As I go through this current hurdle in our lives, my goal will be to run and keep the endorphins revving. That's it! I am confident that my next post will not be so depressing.